City leaders say the first step to fixing up that run-down house on your block is the power to label it "blighted"
West Central neighborhood leader Kelly Cruz says he hopes designating some dilapidated houses "blighted" could lead to improvement. "'Disarray' is the word I prefer to use," says Colleen Gardner, co-chair of the Chief Garry Park neighborhood council. "I would love if we could use the term 'revitalization,'" says Spokane City Councilwoman Amber Waldref. The word they can't escape is "blight." It's a term with ties to inner-city ghettos and eminent domain, but it may also be the key to spending Spokane's share of federal money in a brand-new way. Each year, when the federal government divvies up Community Development Block Grant dollars, cities are restricted in how they can spend that money. Specifically, the spending must be tied to a federal objective: directly benefiting low- and moderate-income people, preventing or eliminating "slums or blight" or addressing some urgent, unfunded safety or health concern. Until now, the city has focused on that first objective in justifying its CDBG spending, but that comes with a whole set of strict regulations. Say the city wanted to tear down a dilapidated house or factory. In many cases, it could only spend CDBG money on parts of the project that it could prove would directly benefit low- to moderate-income people, like new housing, but not on some of the more indirect expenses that might be essential to making a project happen, like improving sidewalks around it or tearing down an old building to make the lot more attractive to a private developer. If the city adds a formal definition of "blight" to its books, though, it could use that second, more flexible objective. Now, a group of city and community leaders is trying to hash out what that definition might look like, and how to start using it without causing neighborhood heartburn. "The word 'blight' doesn't ring well," says Gardner, who also is active with the Community Assembly, the group representing all 27 neighborhood councils. "It's not a word anybody in Spokane has ever heard. ... We don't know how we're going to identify that without making it sound like the city is the next Detroit." Waldref, who represents Northeast Spokane, including Hillyard and east Sprague, says it's a discussion that's come up and faded away before. "Spokane, I think, is just very proud that we don't really have slum areas like you would see in other cities," she says. "What we need to do is get beyond the word and recognize this is an economic development tool." Kelly Cruz, who has long been active in the West Central neighborhood, says he can envision change here. Throughout this historic neighborhood, conspicuous among clean, well-kept houses, are others that are crumbling. Cruz says he's seen houses in the area deteriorate because the cost of fixing them up or tearing them down is more than the value of the land, or what a landowner might ever make off that property. Cruz also points to Monroe Street, a dated thoroughfare that's been home to multiple pedestrian deaths in recent years, as in need of city attention. "I don't perceive [designating an area "blighted"] so much as a negative ... with the realization that a lot of our housing and our commercial buildings are 100 years old and plus, and some of them are in very distressed conditions," Cruz says. "There needs to be some sort of addressment to that." Spokane wouldn't be the first to take this approach. In 2003, Caldwell, Idaho, used about $1.5 million in CDBG dollars paired with other funding to renovate an old train depot in the heart of the city. Surrounded by poor lighting and cracked sidewalks, the depot was decaying, sheets of plastic in the rafters catching the water seeping through the roof. "The downtown area surrounding that was just tired and needed a facelift," says Debbie Geyer, one of the leaders of the project, now the city clerk. With the infusion of cash, Geyer says the area became a vibrant "gathering place" that's now booked for events nearly every weekend of the summer. It also spurred more improvement in other parts of Caldwell's downtown, she says. 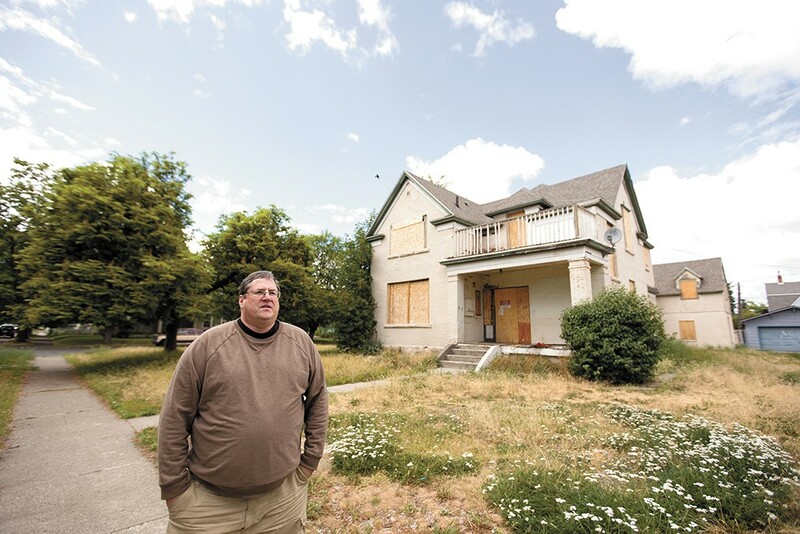 Caldwell created its blight definition with that project in mind, while Spokane is looking to put the definition into the law and then find projects to fit it, creating a sprawling discussion about the issue. Jonathan Mallahan, director of the city's Community and Neighborhood Services Division, who is leading the effort, emphasizes one point that he says will be key to community buy-in: Labeling a building or area "blighted" is a carrot, not a stick. The city's code enforcement office already works to compel property owners to fix up deteriorating buildings. This, Mallahan says, would be a designation neighborhoods could seek out.